The LA Galaxy: Becks to Visit Leno! 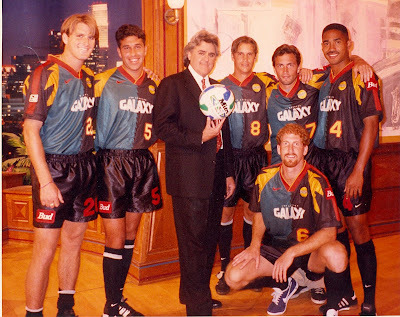 Photo Caption: See how many of these LA Galaxy stars you can id from the club's first appearance on the show in 1996...see bottom of post. LA Galaxy midfielder David Beckham will be a guest on "The Tonight Show with Jay Leno" on Tuesday, April 1. The show airs at 11:35 p.m. ET/PT on the NBC. Other guests scheduled to appear on the show include Sherri Shepherd of "The View" and musical guest The B-52's. WHERE: NBC - Check local listings for the channel in your area. 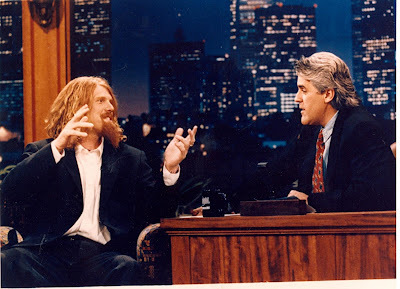 Photo Caption: Becks will be following in the footsteps of many of the worlds most recognizable figures, including this guy above who was making his second appearance on "The Tonight Show". ...From Left to Right: Curt Onalfo (KC Head Coach), Jorge Salcedo (UCLA Head Coach), Jay Leno (Same Job), Brad Wilson (Pension and Benifits Insurance Rep), Andrew Shue (Exec. Producer - Gracie), Dan Calichman (front row - Claremont McKenna Head Coach and CATZ Partner), Robin Fraser (Assistant Coach - Real Salt Lake). I can't wait for this one, I hope leno puts Becks to the test! Tha has to go down as the lowest of all performances..
Wow, a post about Beckham on Leno and nothing about the game on Saturday?? It's probably better this way. I agree with the above anonymous poster. No news on Ruiz or insight or even comment of the loss?! I guess everything is cheery in LA then. You guys are worse than the Iraqi Information Minister.